This is the kind of bread my family has been eating, more times than not, over the past month (bye, bye bread store). It has been dry at times, flavorless, flat (“tiny” as my kids call it) and pretty much gross. But then a few times I have tasted something I only hoped I could recreate each time I made bread. So . . . I practiced. Every Monday and Friday I would make a “new” batch of bread. I would add a little of this, substitute this for that, or even try different kids of grains and flours. I was getting so used to seeing THIS kind of bread, I was starting to think that THIS was the best I could do. Well ~ I WAS WRONG! I made this exact loaf of bread by “accident” last week. I was making a HUGE pot of soup and felt prompted I should share it with my wonderful Young Women’s President. She has been up to her eyeballs in responsibility since our new callings in December. I felt a night off from cooking would do her good. But what to serve with the soup? Of course . . . A homemade loaf of bread! Needless to say, here I had been working hard for WEEKS to make this very loaf of bread for my family, but not until I chose to serve someone out of love and concern, did this loaf appear. 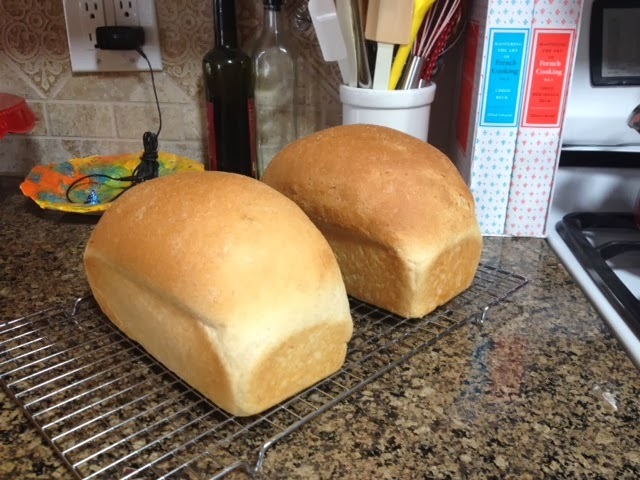 I fortunately made two loaves of bread that day (that is what one recipe makes), so my little ones were able to enjoy the bread along with the Young Women’s President. What was a mother to do? So I got to work, trying to remember exactly what I had done to make this amazing bread. Fortunately, I think I nailed it!?! But I am concerned that the second batch I made today wasn’t as high, smooth or pretty as my first batch (but that might have something to do with the fact that I kept opening the bread machine lid during the 1st rise because I was just too excited to see if I really nailed this recipe). I guess practice does make perfect. So, at the request of so many of you on Facebook, I have decided to share my 1st rough draft of my Homemade Honey Wheat Bread. Mind you . . . I make the dough in the bread machine, take it out, knead it by hand and then place it in bread pans to rise a 2nd time. Then I bake them in my oven. I don’t like the crust the bread machine creates – it’s dry, thick and not very flavorful. I also feel there is nothing better than baking bread in a loaf pan. The pans leave the perfect crispness to the crust yet tenderness to the bread. It also allows the bread to bake in the shape bread is known to be in . . . instead of a massive brick! Not my favorite bread at all! Much better!! Don’t you think? So I will continue to practice this recipe each Monday and Friday. If anything changes to make the bread better . . . I will let you know! If you have any questions . . . you know where to find me. After much pondering on this matter, I have come to the conclusion it must be the ingredients they are using, as well as how they tweak the recipe to fit their appliances, their humidity levels and the altitude they live at. I know about all of this because when we lived in Costa Rica for a month MANY of my recipes struggled and it was due to all of these factors. So please, don’t shoot the messenger if your first few times of making this bread don’t turn out the way my picture did. The point to this whole story is to NEVER give up and to keep trying. If you have a desire to make something, give it your all and eventually you will find what you are looking for! So, here are a few suggestions as to why I think this bread recipe is so successful. I believe it has to do with the brand of: yeast, all purpose flour, wheat and honey that I use. First of all, I am using home ground white wheat flour. We have an electric wheat grinder and we are doing what we do best – rotating our wheat by actually using it. We purchased the white wheat from the LDS Cannery a few years ago. We also have red wheat to use but it tends to be a bit rough on our stomachs. I would eventually like to start making the bread with both types of wheat that we own . . . but that won’t be for a few weeks. I’ll let you know how it turns out. 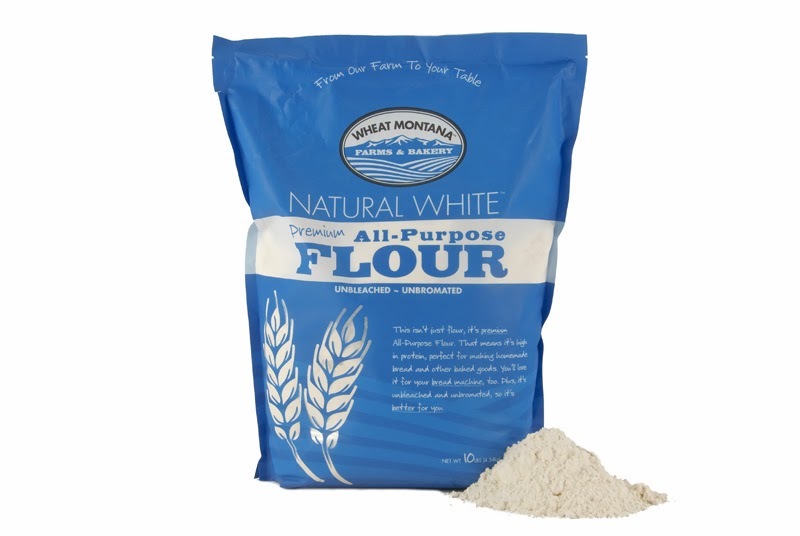 The all-purpose flour that we use is AMAZING! 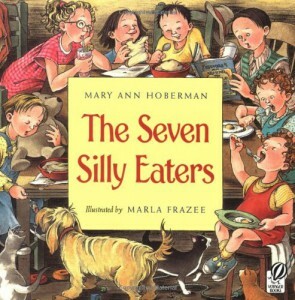 My sweet friend Maria told me about it. It is unbleached, non-GMO and chemical free. It tastes like flour should taste. You can purchase it at Walmart (which is cheaper than getting it directly from the company) in 5# and 10# bags. We go through a 10# bag (just under $7.00) once a month. It is SO WORTH IT! Our cookies, waffles, pancakes and muffins taste so much better too! Next is the yeast that I use. Saf-instant yeast is the best yeast I have ever used. Unfortunately, Walmart, Smith’s or Fresh Market do not seem to carry this product. I have only found it at Macey’s (by Outback Steakhouse and the Movie Theaters), but it is worth the drive. If you have yeast that you have on hand, use it. But . . . if you find your bread isn’t rising like you want it to or that the flavor is off, I would consider trying these ingredients. The right ingredients honestly do make all the difference. Last, but never least, is the honey that you use. My suggestion . . . find a honey that your family LOVES and use it in the bread. Don’t go for the cheap, yucky honey. If you know of a honey supplier, buy their honey. 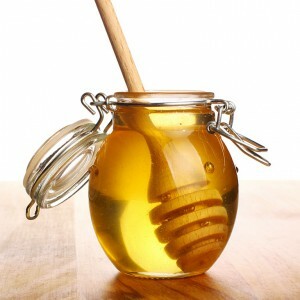 Local honey is the BEST for you and has so many health benefits. 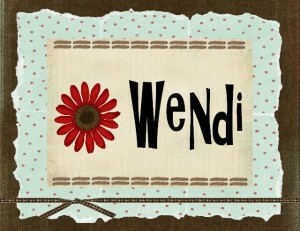 If my supplier makes another order, I can let you know about it, but her honey comes from down south. I wonder what local honey would taste like to my family? Hum . . . something to think about this summer! Now, onto the details of the recipe. I honestly just took my bread machine’s Whole Wheat Bread recipe and made a few simple changes. Instead of using only Whole Wheat – I did 4 cups wheat and 1 cup all purpose flour. I also changed the sugar it called for to honey – thus making my recipe a Honey Whole Wheat bread. 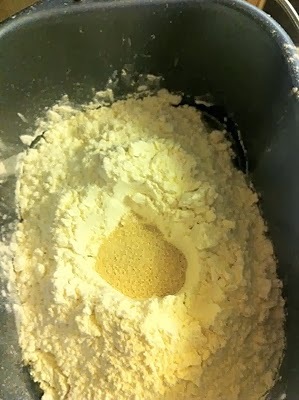 Lastly, I increased my yeast from 2 teaspoons to 3 teaspoons (or 1 Tablespoon). I feel in the winter that the air is drier and it is colder all together in my home. The extra yeast is good for rising and it gives us the fluffiness we prefer in our wheat bread. The bread machine recipe also called for a few unique ingredients: dry milk, butter and wheat gluten. Now . . . 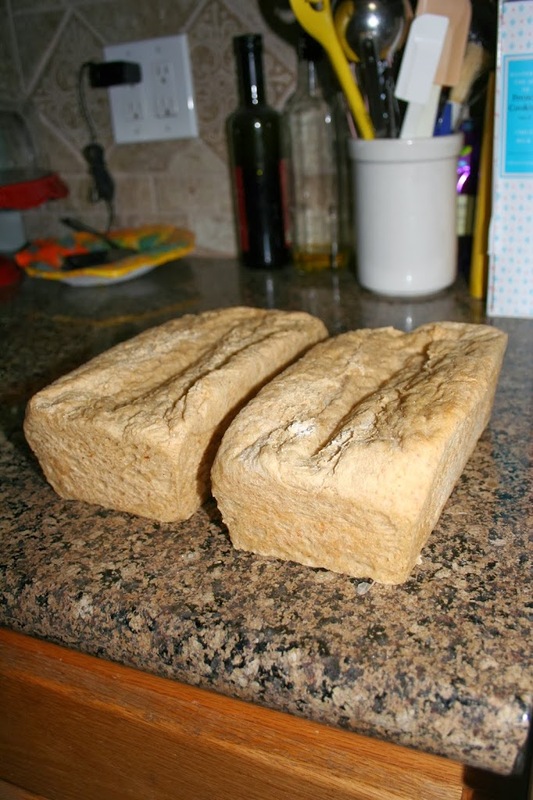 I have made MANY batches of bread without the gluten and my bread turns out crumbly, tough/chewy and goes dry quickly. So I moderate the gluten and use a bit less than what the recipe calls for. You can add it or not, but that will make a huge difference in the loaf you get. And yes, I was worried about gluten allergies too but to be honest, we feel fine and I believe that if you are using the best ingredients you can for your family, it all works out in the end. Moderation in all things! As for the butter – I THINK IT MAKES A HUGE DIFFERENCE to the loaf . . . SERIOUSLY! Don’t leave it out! One last tip . . . don’t put the salt anywhere near the yeast. I haven’t tried adding the salt into the water first – I wonder how that would work out? I’ll let you know in a few weeks. For now, I make a well in the middle of the dry ingredients BEFORE I add the salt. Then I just sprinkle the salt along the left and right sides of the pan away from the well. Then I carefully add the yeast to the well. Salt will kill your yeast! So keep them away from each other! Lastly . . . be careful with your measuring. 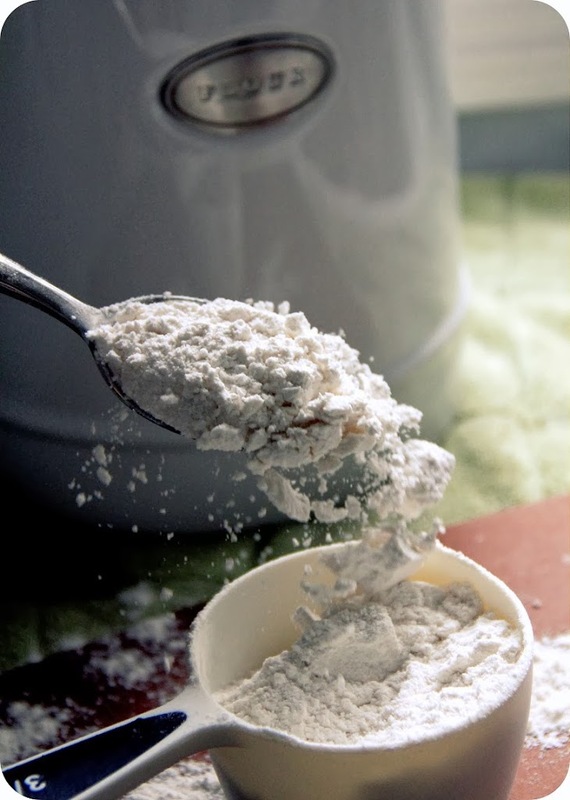 Many times we are adding TOO MUCH FLOUR to our recipes. Flour should be measured carefully. You can scoop the flour with a spoon and ladle it into the measuring cup or you can use a smaller measuring cup and do the same thing. Level off the top and pour that into the bread machine pan. 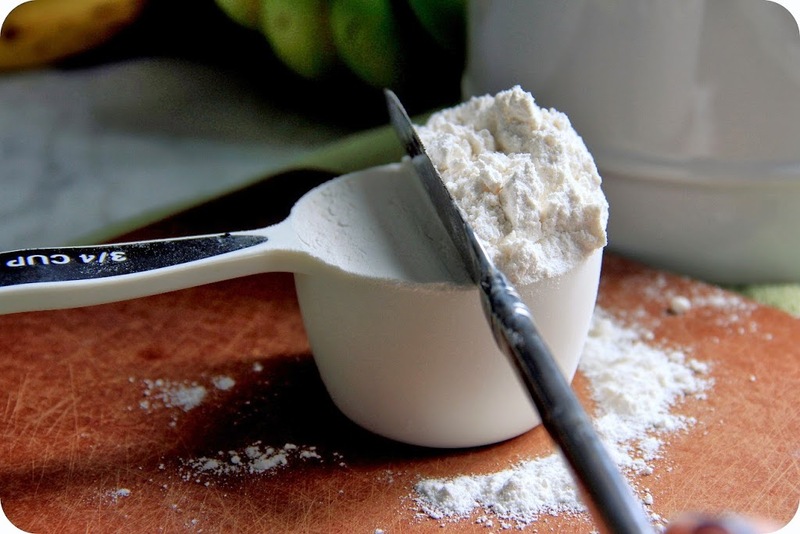 If you just scoop your flour up with your measuring cup, you are packing down the flour and increasing the density of your loaf. The point to all of this??? These tips might just help you understand why making bread in the past didn’t turn out like you hoped it would. Also, take a look at YOUR bread machine’s recipe book. Those recipes have been tested and proven for your machine (especially the size of the dough it will make) and you can tweek the recipe to work for you. Just make the changes I made above to the ratios that you need for your recipe. If you need any help, you know where to find me. 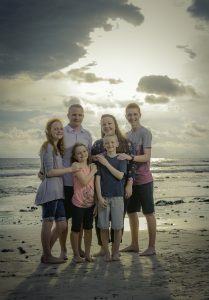 Well, I hope this post has helped one of you in some way. I know it helped me! I got to see HOW Heavenly Father works in our lives, giving us blessings for serving others. I also realized how important it is to not only serve others but to also let others serve you – because you are allowing them to be blessed if you do! Directions: Gather all ingredients around your bread machine. Gather all cups & spoons. Pour water in first, then honey & butter. Add flours, milk, gluten. Make a well in the middle of the ingredients. Sprinkle the salt around left and right sides of pan – be sure to stay away from the well. Pour the yeast carefully into the well. 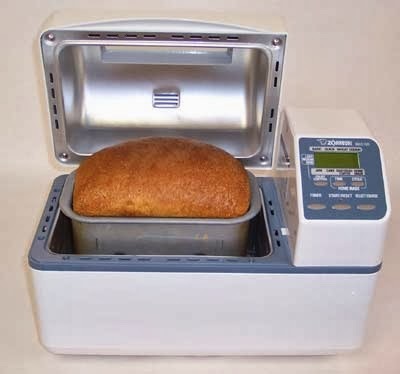 Close lid and start your bread machine on the dough cycle. Now, this is the tricky part! You need to raise your bread in a semi-warm room. That can be hard in our cold homes during the winter. I tend to use my dishwasher on the mornings I make bread, so I will place my pans on the counter top above the dishwasher (it is nice and warm there). I will also cover my two loaf pans with a thin tea towel that has been soaked in warm/hot water and rung out completely; that helps trap the gases in the bread and allows it to rise. If you don’t have that option, you can use your oven. Preheat your oven to 250 degrees. If you have two racks in your oven, place one rack on the lowest shelf and the other rack just high enough to get a 9×13 pan in between the two racks (you don’t want the top rack to be to high, to allow the bread to rise and touch the top of the oven). Next, heat up hot water in a kettle. When boiling, fill the 9×13 pan half way with the hot water. Place your loaf pans on the top rack and shut the oven – NO tea towel on top of the loaf pans. Allow your bread to rise until double in size. This can be anywhere from 20 – 40 minutes, depending on the warmth of the kitchen and humidity in the air. If the loaves are rising on the counter, you may begin to heat your oven to 375 degrees. If your loaves are in the oven, GENTLY take them out of the oven (this is how my ugly loaf occured – above picture) and preheat your oven to 375 degrees. Also, take out the pan of water. You don’t want to cook the bread with the water still in the oven. Return the loaves and bake them for 20 – 25 minutes, until lightly brown on the top. Remove bread from oven and immediately remove the loaves from the pans. I put an oven mit on the top of the loaf and use another oven mit to pull the pan away from the bread. Allow the bread to cool on a cooling rack for at least 20 minutes to 30 minutes before cutting. But . . . if you MUST break the cardinal rule . . . go ahead and cut yourself a slice. There is NOTHING better than a HOT SLICE of bread with butter and honey on it!! Or just butter! But, your bread will squish if you continue to cut into it. Just cut a slice, or two (wink), and then allow the rest of the loaf to cool. I like to pre-slice my loaf for my kids. If I let them do it, my bread looks horrible and the serving sizes/slices of bread are a disaster. Pre-slice your bread at least 1 hour after cooling. 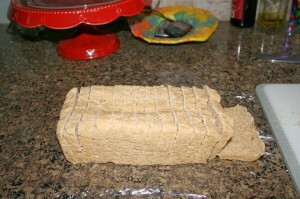 Then store that loaf in a ziploc gallon sized bag – making sure to squeeze out any air before sealing. If you want to freeze your loaf, just pre-slice the cooled bread (must be cooled completely before freezing!). Then wrap it in plastic wrap completely. Next, wrap in aluminum foil. Then place in a gallon sized ziploc bag. These steps will insure no freezer burn or dry bread occurs. Use bread within 3 months for best results.